For other uses, see Alkmaar (disambiguation). 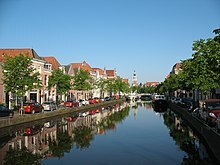 Alkmaar [ˈɑl(ə)kmaːr] ( listen) is a city and municipality in the Netherlands, located in the province of North Holland. 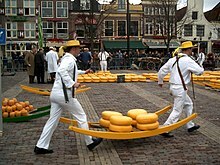 Alkmaar is well known for its traditional cheese market. For tourists, it is a popular cultural destination. The earliest mention of the name Alkmaar is in a 10th-century document. As the village grew into a town, it was granted city rights in 1254. The oldest part of Alkmaar lies on an ancient sand bank that afforded some protection from inundation during medieval times. Even so, it is only a couple of metres above the surrounding region, which consists of some of the oldest polders in existence. Older spellings include Alckmar. In 1573 the city underwent a siege by Spanish forces under the leadership of Don Fadrique, son of the Duke of Alva. The citizens sent urgent messages for help to the Prince of Orange; he responded by promising to open the floodgates of the dykes and flood the region if the need arose, which despite the protestations of the peasantry, fearful for their harvest, he proceeded to do. Some of his dispatches fell into the hands of Don Fadrique, and, with the waters beginning to rise, the Spaniards raised the siege and fled. It was a turning point in the Eighty Years War and gave rise to the expression Bij Alkmaar begint de victorie ("Victory begins at Alkmaar"). The event is still celebrated every year in Alkmaar on 8 October, the day the siege ended. In 1799, during the French Revolutionary Wars, an Anglo-Russian expeditionary force captured the city but was ultimately defeated in the Battle of Castricum. After that battle, on 18 October 1799, the two opposing sides held the Convention of Alkmaar which met to determine the fate of the defeated Anglo-Russian force. The French victory was commemorated on the Arc de Triomphe in Paris as "Alkmaer". 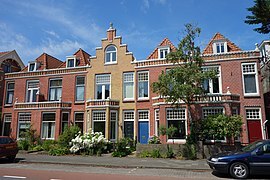 The municipality of Alkmaar historically consists of the following cities, towns, villages and districts: Alkmaar, Bergermeer, Daalmeer, De Hoef, De Horn, De Nollen, Het Rak, Huiswaard, Koedijk (southeastern part), Overdie, Oudorp and Omval. On 1 January 2015 the municipalities of Graft-De Rijp and Schermer were merged into Alkmaar. 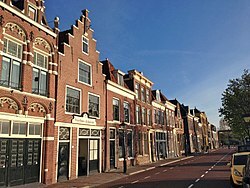 The historical village of De Rijp is thus since a part of Alkmaar. 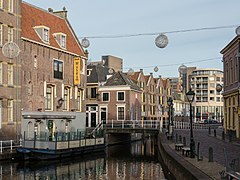 There are direct trains to Den Helder, Hoorn, Zaandam, Amsterdam, Utrecht, Ede, Arnhem, Nijmegen, 's-Hertogenbosch, Eindhoven, Maastricht and Haarlem. For exact details see Alkmaar railway station. The waterway Noordhollandsch Kanaal, which opened in 1824, runs through Alkmaar. As of 2017[update]. it can be crossed (among other ways) using two of the five operating vlotbruggen, Koedijkervlotbrug and Rekervlotbrug. 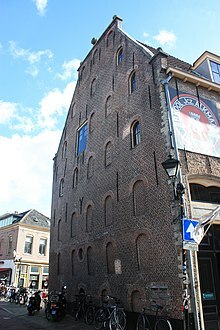 Alkmaar has many medieval buildings that are still intact, most notably the tall tower of the Grote of Sint-Laurenskerk, where many people from Alkmaar hold their wedding ceremony. The other main attraction, especially in the summer months, is Alkmaar's cheese market at the Waagplein, one of the country's most popular tourist attractions. The cheese market traditionally takes place on the first Friday in April and the last market of the season is the first Friday in September. Every Friday morning (10:00–12:30) the Waagplein is the backdrop for this traditional cheese market. After the old-fashioned way of the hand clap, traders and carriers will weigh the cheeses. It is one of only four traditional Dutch cheese markets still in existence. The traditional fare of this cheese market is those cheeses made in the local area, as opposed to the well-known brands of Dutch cheeses, including the Edam and Gouda cheeses. It is not actually possible to buy cheese at the market itself, which is really only a demonstration of how this merchants' market operated in times gone by. However, the demonstration, which takes place in front of the medieval weighing house, is surrounded by many specialized stalls where it is possible to buy all kinds of cheese (and non-cheese) related products. The Waag is also home to the local tourist office and a cheese museum. 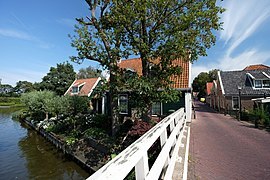 Alkmaar has 399 registered rijksmonuments, of which most are situated along the city's old canals. 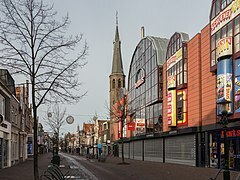 Alkmaar has two large theatres and a big cinema (which was originally two cinemas). A red light district is situated at the Achterdam, and Alkmaar has a nightlife scene as well which takes place in the pubs in front of the cheesemarket. Every year, at the end of May Alkmaar hosts the four-day event Alkmaar Pride, which has a canal pride parade on Saturday. Alkmaar is home to the professional football team AZ (Alkmaar Zaanstreek). In 2006, the club moved to a new 17,000 capacity stadium, the DSB Stadion, now named the AFAS Stadion. In 2008–2009, AZ won the Eredivisie, the Dutch football league. It was the second league title for the club after the Eredivisie in 1980/81 with only one league defeat. Maria Tesselschade Roemers Visscher (1594-1649), poet and engraver. ^ "College van burgemeester en wethouders" [Board of mayor and aldermen] (in Dutch). Gemeente Alkmaar. Retrieved 19 February 2014. ^ "Postcodetool for 1815AG". Actueel Hoogtebestand Nederland (in Dutch). Het Waterschapshuis. Archived from the original on 21 September 2013. Retrieved 19 February 2014. ^ nl:Lijst van rijksmonumenten in Alkmaar. ^ "Bath's Twinning Associations". The Mayor of Bath. Archived from the original on 17 May 2011. Retrieved 15 July 2013.